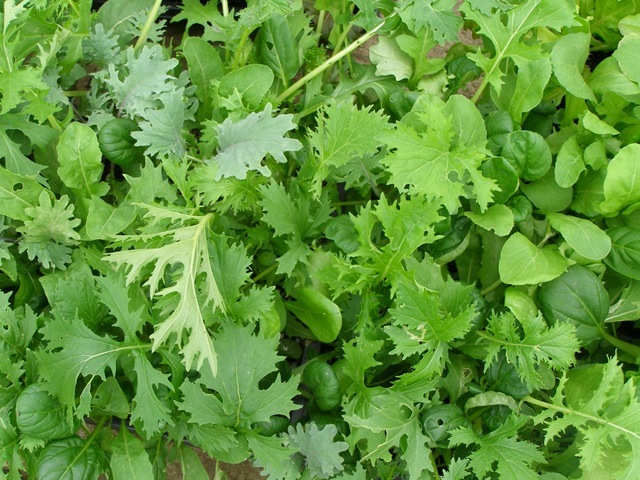 Description: Mesclun Blend Mix incorporates different lettuces as well as herbs. Arugula, mizuna, tatsai, endive, chervil, radicchio and kale are in the mix. Raspberry Dresing Rumex has a flavor similar to spinach or chard. It has light green leaves with dark maroon veins that grow in a rosette pattern. 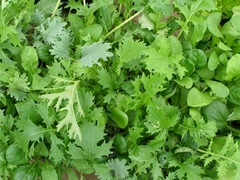 Salad Bowl Mix includes Parris Island, Red Salad Bowl and Royal Oak Leaf. Recommended Spacing: 10″ to 12″ apart. Height: 6″ to 8″ tall. How To Grow: Plant in full sun. Lettuce can take some shade. Outstanding Features: You can plant lettuce every two weeks or so from spring until fall to have a continuous supply of fresh salad. Keep soil moist and fertilized. Tips: Harvest as soon as the lettuce is 2 to 6 inches long. Cut in the morning if possible. Avoid using pesticides on lettuce because it will absorb it. If pesticides are needed find one that is relatively harmless or organic. Recommended Uses: Use for salads.